Some of the most dangerous industries in America are those involving electricity. It’s no secret that electrical currents can be deadly. For those who work around electricity, much caution must be taken to ensure safety. Many workers are unaware of potential electrical hazards in their workplace, making them more susceptible to electrocution. Electrical injuries are a serious matter. Some of the most common injuries include severe internal burns, heart injuries (including cardiac arrest), loss of consciousness (which can result in brain injury), seizures, tissue degeneration, nerve damage, and worst of all, death. Providing a working environment in which employees can feel safe should be a key priority for all employers. However, this is not always the case. Negligence on the part of employers, building owners and other parties can cause dangerous electrical accidents – leaving victims with serious medical and financial hardships. If you or a loved one has suffered a serious electrical injury while on the job, be certain to get treated and tested thoroughly by a medical professional. In many cases, the effects of the shock are not immediately realized. Electrical hazards cause more than 300 deaths and 4,000 injuries in the workplace each year. Electrical accidents rank sixth among all causes of work-related deaths in the United States. Electrical accidents on the job cause an average of 13 days away from work and nearly one fatality every day. Approximately 62 percent of an estimated 32,807 nonfatal electrical injuries occurring between 1992 and 1998 were classified as electric shock and 38 percent as electric burns. The nonfatal workplace incidents that cause the highest number of days away from work include contact with an electrical current or a machine, tool, appliance or light fixture (38 percent), and contact with wiring, transformers or other electrical components (33 percent). Nonfatal electrical injury occurs most often to those who work with machines or tools and around electrical wiring other than power lines. Over the last 10 years, more than 46,000 workers were injured from on-the-job electrical hazards. During the work day, a worker is hurt every 30 minutes so severely from electricity that it requires time off the job. While some electrical injuries do occur accidentally, oftentimes there are situations in which electrical shock injuries are caused by negligence. Many of these accidents can be prevented if employers follow safety rules and regulations, implement robust training sessions and have safety awareness programs. Unsafe working conditions, faulty or damaged equipment, and insufficient training can all cause electrical injuries due to employer negligence. In these cases, employers are negligent in warning or protecting workers from harm. When negligence occurs, the worker is entitled to certain benefits. If you have suffered an electric shock in the workplace and sustained injuries that require medical treatment, then you most likely qualify for workers’ compensation. You could be compensated for pain and suffering due to long-term damage and emotional anguish, loss of wages, medical bills, funeral and other expenses. Pain and suffering due to an employer’s negligence or misconduct is an unacceptable practice and should not be looked at lightly. You need to hire a reputable lawyer that will help you with your case. 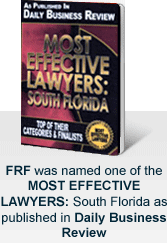 The Law Firm of Friedman Rodman and Frank is dedicated to helping injured workers. If a party unconnected with your own employer such as a contractor, subcontractor, manufacturer or another third party was responsible in whole or part in causing your work accident, you have an opportunity to recover additional compensation through a personal injury claim. To discuss your options with an experienced Miami worker's compensation attorney, contact our law firm online or call 305-448-8585 or toll free at 877-448-8585 to schedule a free initial consultation with a highly experienced lawyer. We are available 24 hours a day, seven days a week. All consultations are free and confidential.